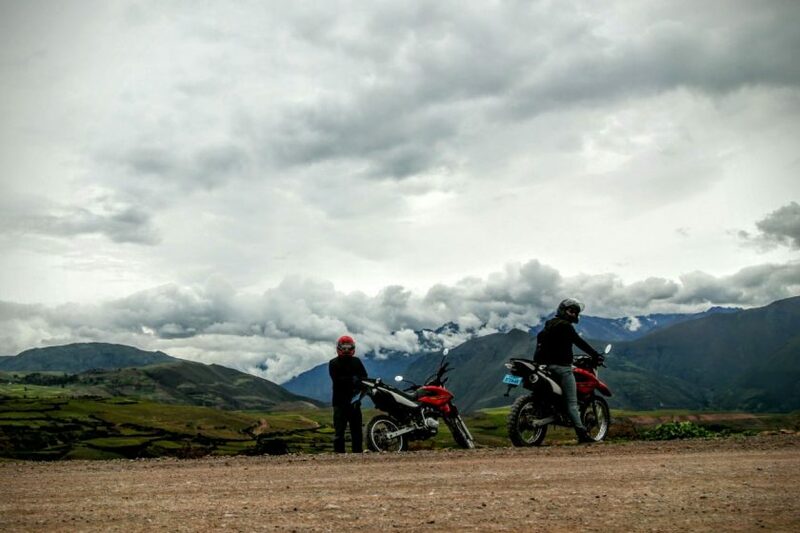 Beautiful winding roads make the Sacred Valley of the Incas perfect for motorbikes. A few tour operators near Cusco’s Plaza de Armas rent out motorbikes. If you ride, they are a great option for getting out of the city and exploring the region. A Honda XR150 will cost you s/70 a day, while a Honda Tornado 250 will set you back s/90. With the hilly terrain, do yourself a favour and get the 250, you’ll be one of the fastest vehicles on the road. Disclaimer: don’t rent a bike if you’ve never ridden before. You need to ride extremely defensively in the city, and struggling to operate the bike, while weaving through traffic, is a recipe for disaster. (One day Renée explained how the clutch works to a tourist on a busy road). The bikes are fairly new and in good condition. They are trail bikes, with fairly knobbly tyres, which can be quite slippery on Cusco’s ancient paved roads. Hill starts in the city are a pain. From Renée: being unable to touch the ground on the trail bike, I took a sharp hook turn up a steep incline, on a cobblestone road with a funky right hand camber. So, after 5 mins of riding, I dropped the bike. Getting it upright wasn’t hard; trying to get 250cc bike to get going, up a slippery hill, with a dozen cars honking aggressively was definitely a challenge. One you are out of the city though, the ride is magnificent. The roads are in pretty good condition and there isn’t a lot of traffic, giving you the freedom to really just enjoy the ride. 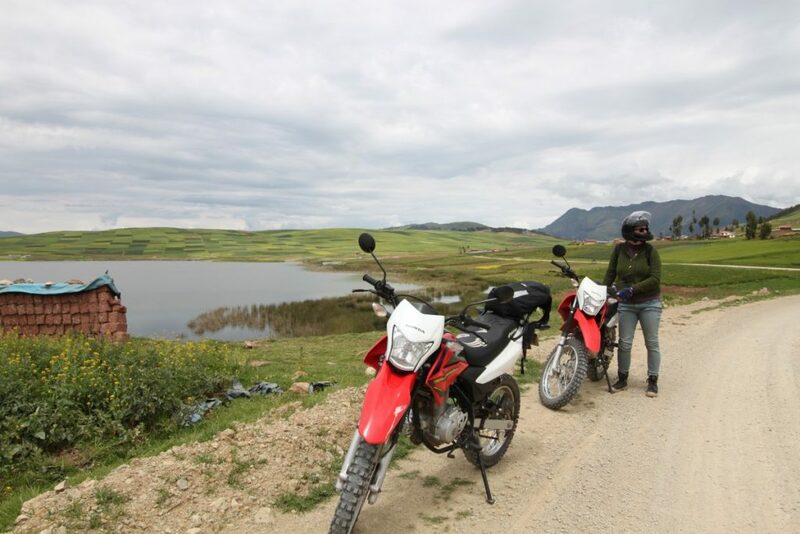 Our plan was to ride from Cusco to Chinchero, but we missed a turn. We ended up in Izcuchaca, a small but bustling town. It was the first day of school, and there were people everywhere. From Izcuchaca we took a gravel road north to meet back up with the main highway. The road was twisty, but in good condition, and the trail bikes were more than happy. A few locals were eager to give us directions. We passed through beautiful farmland, and past Laguna Huanypo, a vast lake in the middle of nowhere. Accidentally finding ourselves on this detour was a highlight for me. From Renée: yeah, it was lovely. I just spent a little more time than Michael staring at the sheer cliffs off the hairpin gravel roads. Back on the main road, we headed for Maras. The village has narrow one way cobblestone roads, with drainage channels in the centre, making it a bit stressful on bikes. Otherwise known as, Renée dropped the bike again. A few km outside of Maras is the Incan site of Moray. 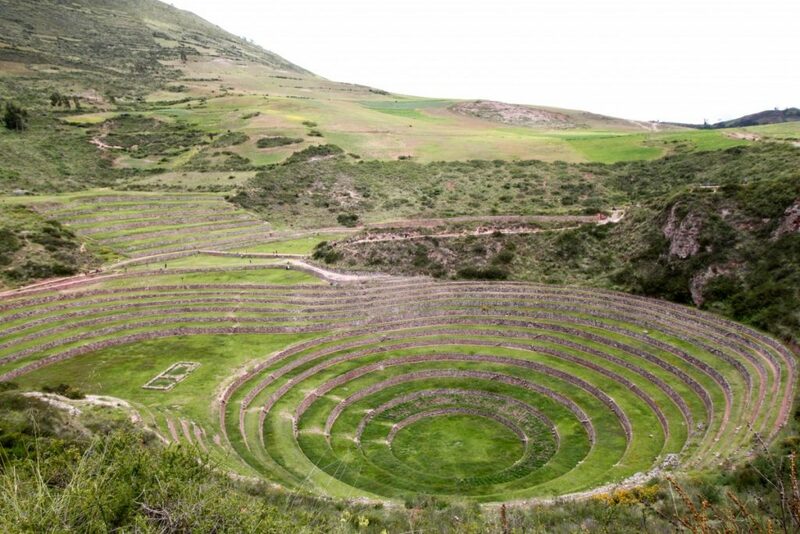 Moray is a set of farming terraces; concentric circles carved into the mountains. 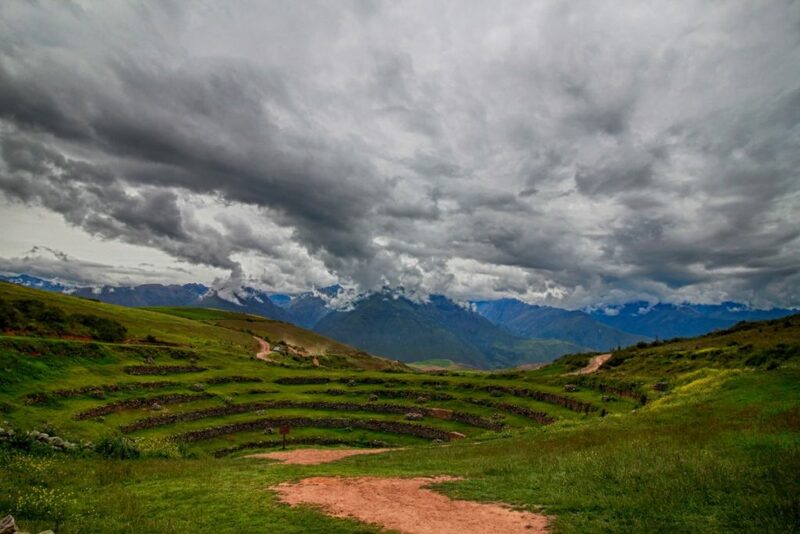 I’ve heard Moray described as a laboratory, where the Inca took advantage of microclimates to gradually acclimatise plants to higher altitudes. Very cool . We left Moray and headed to Urabamba for lunch. The road into Urabamba is a twisty descent down into the valley. 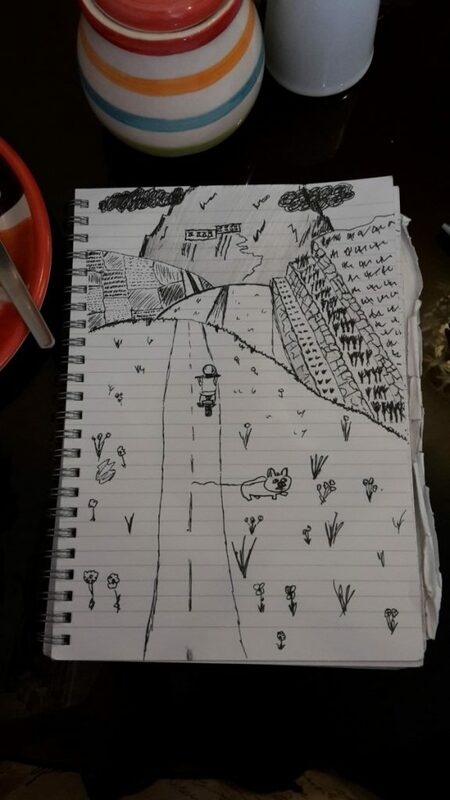 You need to be careful of both uneven road (stunt jumps) and animals running in front of you. From Renée: I locked up the brakes twice. Once for an old dog that limped onto the road, while a shepherd looked on. Once because a pig crossed the road between Michael and I, I was afraid it’s trailing rope would get tangled in my wheels. The main road to the plaza was being excavated the day we were there. So one lane, shared by traffic in both directions, with a two foot drop to the right. We quickly found somewhere to eat, a place with a s/5 set menu. That’s $2 for soup, spaghetti with chicken, and a house brewed ‘cordial’ drink. The other diners included a campesina with a rug of goods strapped to her back and a family celebrating the end of the first day of school, the daughter was in a public school uniform. 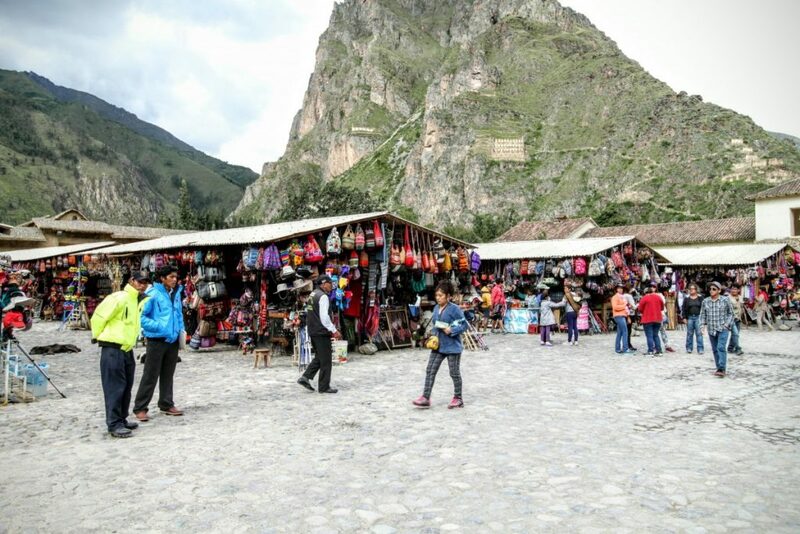 After lunch we set off towards Ollantaytambo, a popular tourist village as it is the main route to Machu Picchu. 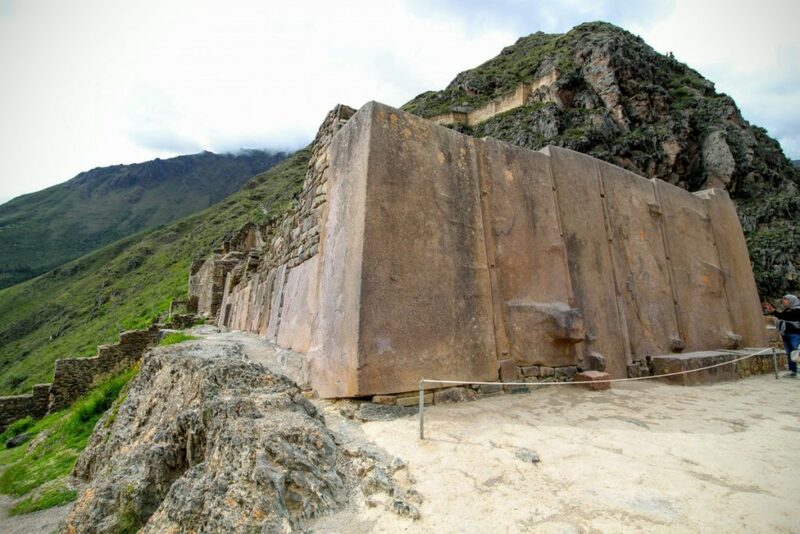 It is also home to some impressive Incan ruins, with an intact Temple of the Sun (sans gold) and Temple of the Water. 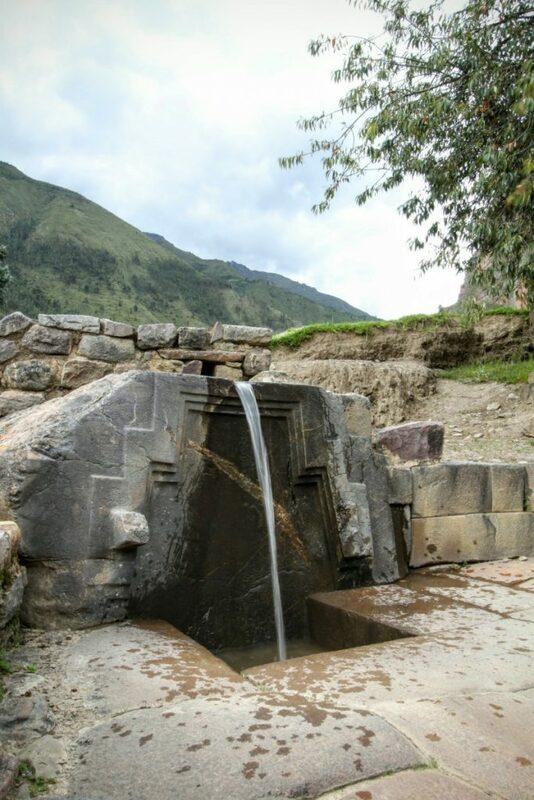 Once again, I am amazed at the Inca’s skill in hydro-engineering. Fountains and baths, fed by the river, that seem to defy gravity. 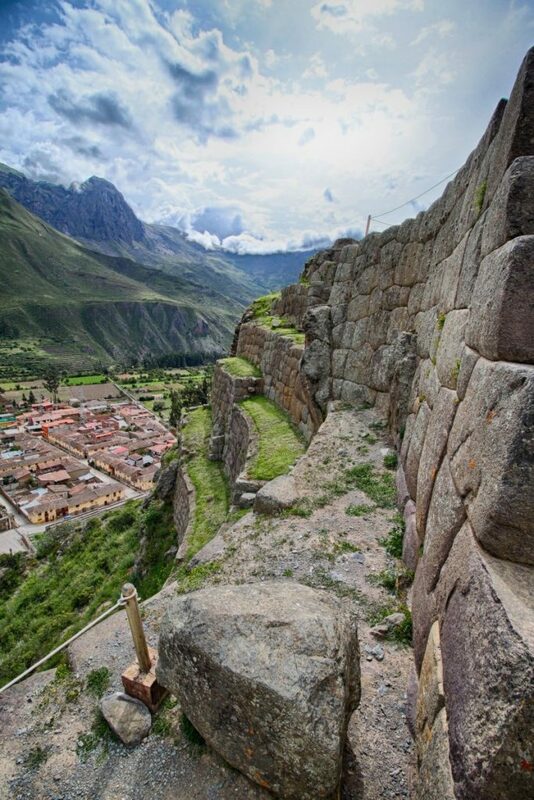 The Inca abandoned Ollantaytambo before it was finished, thanks to the Spanish arrival, but it was used as a resting place for Inca elite. The ride between Urabamba and Ollantaytanbo is in the bottom of the valley, following the Urabamba River. The ride is easy and the view is glorious. From Renée: except in the township of Ollantaytambo, where the road surface is 500 year old cobblestone. It’s a bit jarry. After the ruins we set off back the way we came, towards Chinchero. 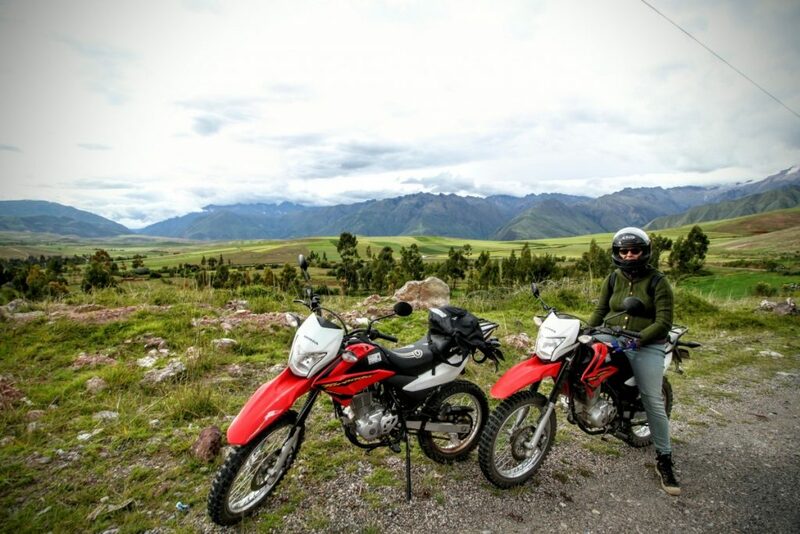 Chinchero is home to more ruins, but unfortunately we arrived late and needed to get the bikes back. A quick fuel stop and we headed for Cusco. Traffic picks up during the approach into Cusco, and you need to keep your wits about. We arrived into the city proper around 5:30pm – rush hour. Utter chaos. We guessed our way back to the historic centre, weaving through traffic jams and an apparent lack of road rules. I was rear ended by a car in traffic. All in all, an awesome day out. I do have some advice if this is something you want to try. Dont do this unless you already ride! It gets cold by 4pm at the higher altitudes around Chinchero, so bring appropriate clothing. if the hire company ask if you’re ok with fingerless gloves, remember how cold it gets riding. If you aren’t comfortable riding in Peruvian peak hour, consider breaking the ride into two days and spend the night in Ollantaytambo. Nice bitumen road, not much traffic. Tick off a bunch of items on the Boleto Turistico (a joint ticket for ruins and museums in and around Cusco). Nice bitumen. Don’t miss the turnoff to Chinchero like we did. The descent down into Urabamba is steel and twisty, and the road has potholes in places. This is what we did after missing the Chinchero turnoff. The road from Izcuchaca is about 15km of well maintained gravel, before joining back with the Chinchero-Urabamba road. Beautiful scenery, zero traffic, but gravel hairpins. Beautiful, flat, but more tourist buses.